Volkan Oezdemir (15-3 MMA) will enter tonight’s contest looking to rebound, this after suffering back-to-back stoppage losses to Anthony Smith and Daniel Cormier in his most recent octagon appearances. Prior to the setbacks, “No Time” had strung together five wins in a row, which included three first round knockouts. 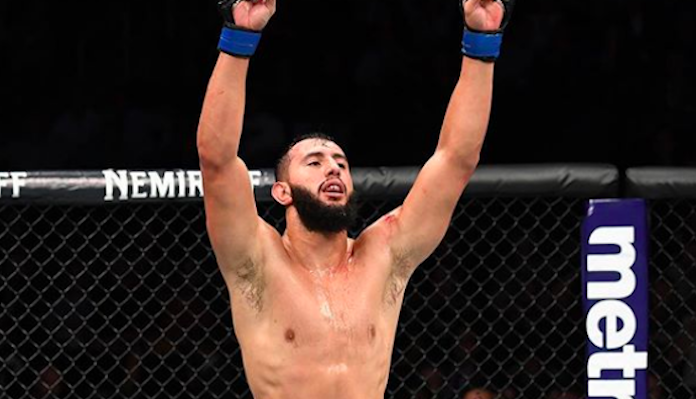 Meanwhile, Dominick Reyes enters tonight’s UFC London event sporting a perfect professional record of 10-0. In his most recent effort at UFC 229, Reyes scored a unanimous decision victory over Ovince Saint Preux. Round one begins and Reyes starts things off with an inside low kick that lands. He goes high with a kick that is partially blocked by Volkan. Reyes is looking to catch Oezdemir coming in. Volkan with a left. Reyes with a good inside low kick. He’s bouncing around early. Volkan leads in with a combination. Reyes circles off the fence. Volkan misses with a spinning back fist. Reyes with a kick that appears to land low. The referee steps in. Volkan says he is ok and we continue. Reyes with a hard low kick. Volkan leaps in and lands a right hook. He misses with a big punch. Volkan with a low kick that knocks Reyes to the canvas. Dominick scrambles back to his feet but Volkan grabs him and presses him up against the cage. Reyes quickly breaks free. Oezdemir chases after him with punches. Reyes avoids and lands a low kick. He leaps in with a left but Volkan ducks under the punch and scores a takedown. Reyes scrambles and gets back to his feet. He breaks free from the fence and lands a jab. Reyes with a high kick which is blocked easily by Volkan. A follow up front kick connects to the body. Volkan misses with a left hook. Reyes lands a kick to the body. Oezdemir returns fire with some body shots. Reyes scrambles off the fence. Both men attempt high kicks but neither lands. The horn sounds to end round one. Round two begins and Reyes lands a low kick. Oezdemir leaps in with a left hand. He follows that up with a low kick. Volkan tries to go high but slips and falls to the floor. He pops right back up but eats a hard low kick from Reyes. Dom with a jab now. Volkan returns fire with a low kick. Reyes leaps in with a left that misses. He circles along the fence while Oezdemir attempts to cut him off. Another good low kick from Reyes. He throws a jab to the body of Volkan. Reyes shoots in for a takedown but Oezdemir defends. Reyes with a nice kick to the body of Volkan. He takes the center of the octagon and lands a right hook. Volkan with pressure now. He lands a left hook followed by a knee. Reyes’ nose is bleeding now. He lands a low kick to try and slow Volkan’s pressure. Oezdemir shoots in for takedown but it is not there. Reyes with a nice left hand up the middle. Volkan tries to slip and rip but his punch falls short. One minute remains in round three. Reyes with a low kick. Volkan replies with one of his own. Reyes throws a straight left but it falls short. Oezdemir shoots in and looks for a late takedown. Reyes defends and the horn sounds to end round two. Round three begins and Reyes takes the center of the octagon and lands a low kick. He throws another but Volkan catches it and drags him to the floor. Reyes immediately shoots up to his feet and the fighters clinch along the cage. Reyes breaks free and lands a left. Volkan steps forward with a pair of low kicks. He circles to his left and Reyes unloads a flurry. Dominick with a jab to the body. Volkan throws a right hook that just misses. That had bad intentions behind it. Oezdemir throws a high kick which Reyes blocks. Volkan shoots in for a takedown but Reyes defends well. The fighters break and Reyes comes forward with a combination. He lands a front kick to the body. A lot of volume now from Reyes. Volkan looks to be slowing down. Just over one minute remains. Reyes with a left hook. Volkan circles to his left. Reyes with a pair of punches. Volkan looks for a takedown but it is not there. More shots from Reyes now. Volkan replies with a right hand over the top. Both men connect with left hands. Reyes comes forward but can’t connect with what will serve as his final strike of the fight.